Bignami lecture series come from the name of the founder of the original IMD Business School. In 1957, Enrico Bignami, the managing director of Nestlé at that time, founded IMEDE (which became IMD in 1990). His aim was to provide teaching for private sector executives. In 1981, he founded IDHEAP (the Swiss Graduate School of Public Administration) for public sector managers. Today it is essential that these two sectors come to know each other better and cooperate more closely with the aim of optimum governance of public affairs. For this reason, IDHEAP and IMD have launched the Bignami Lectures, a series of presentations by members of each institution’s faculties, and which will be presented at the other institute. They are aimed at students, alumni and all those concerned by public affairs. 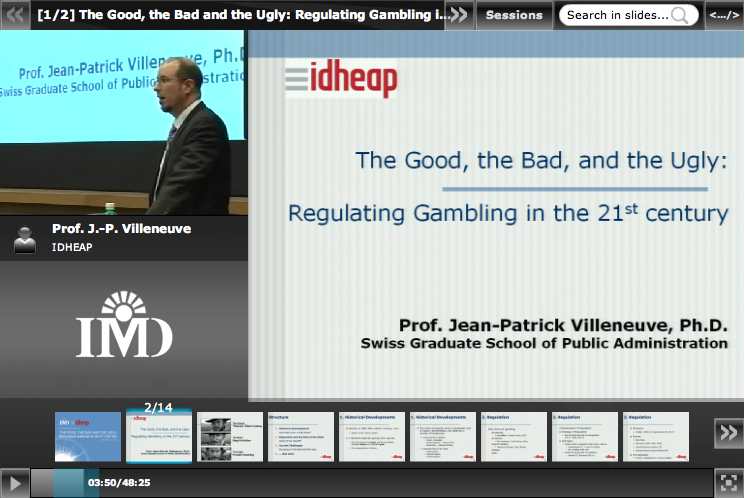 The initial lecture was given at IDHEAP in June by IMD’s Prof. Jean-Pierre Lehmann and the second was given by Prof. Jean-Patrick Villeneuve, IDHEAP.